Show Racism the Red Card are delighted to announce Stuart McCaffrey, current Greenock Morton Defender, as a Show Racism the Red Card Coach. McCaffrey began his career as a trainee with Hibernian before signing for Aberdeen in July 1998. 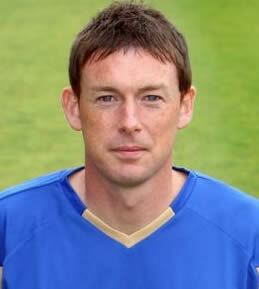 Failing to break into the Aberdeen first team, he signed on loan for Inverness Caledonian Thistle in September 2000. This was followed by a permanent contract. McCaffrey made more than 150 appearances for Inverness, and has scored five goals. He was part of the Inverness defence, playing alongside the likes of Bobby Mann, Stuart Golabek, Ross Tokely, Grant Munro and Darren Dodds. McCaffrey joined St. Johnstone on a six-month loan on 31 December 2007, and made the move permanent in April 2008. McCaffrey has Scottish Challenge Cup and Scottish Football League First Division, winner's medals, both won whilst playing for Inverness. He has become a regular in the heart of the St. Johnstone defence, and has also scored a few goals. Unfortunately, he also scored an own goal in a Scottish Cup tie against Rangers, when he diverted a cross ball past Alan Main. After being restricted to 12 appearances for Saints during the 2009-10 season due to injuries, McCaffrey signed for Greenock Morton on a free transfer in July 2010. Throughout his football career, Stuart has been involved in Red Card club events sitting on the panel and answering questions from visiting school children on the subject of racism. He has been keen to get more involved with the Red Card and has visited four schools in the last four weeks shadowing the other Red Card coaches delivering fun and fitness sessions and assisting with a range of formats of educational input in the classroom. We are keen to involve Stuart in as much as possible and believe he will be an excellent addition to the team.